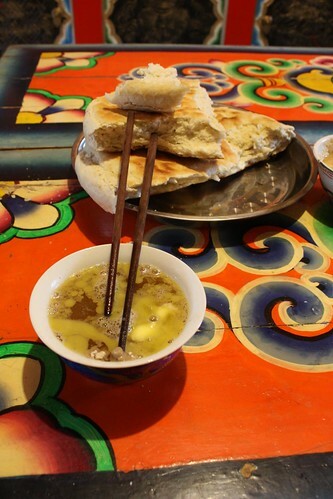 I could go for some yack butter tea and barley bread right now. Really. We were served the version with honey and not salt, although the yak butter was quite salty, which made a nice balance. 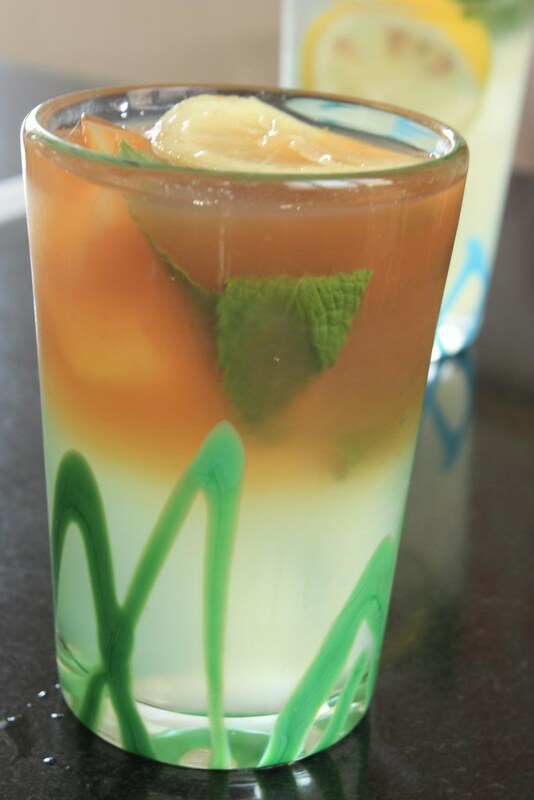 The tea, made from smoked leaves of a Tibetan bush, is rumored to give the body strength and energy and warm the soul during cold days and nights. 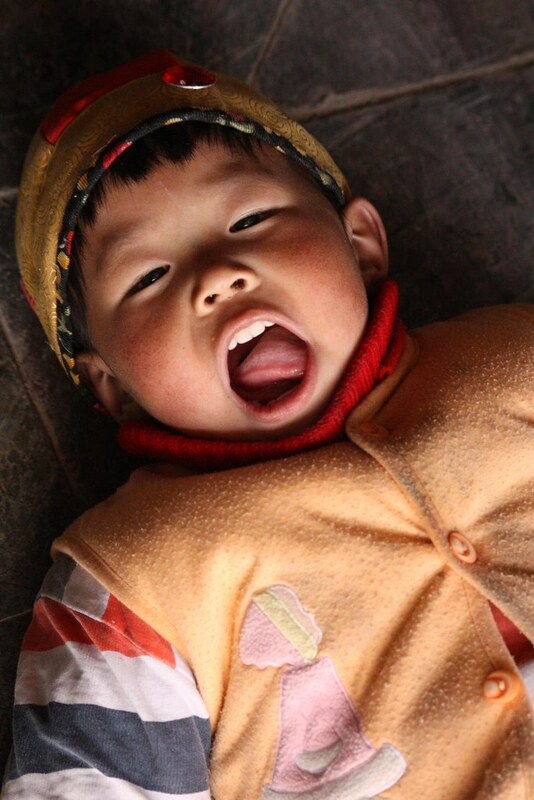 It’s a little crazy that at this time last year we were there in a hauntingly beautiful valley in southwestern China. And it was damn cold. 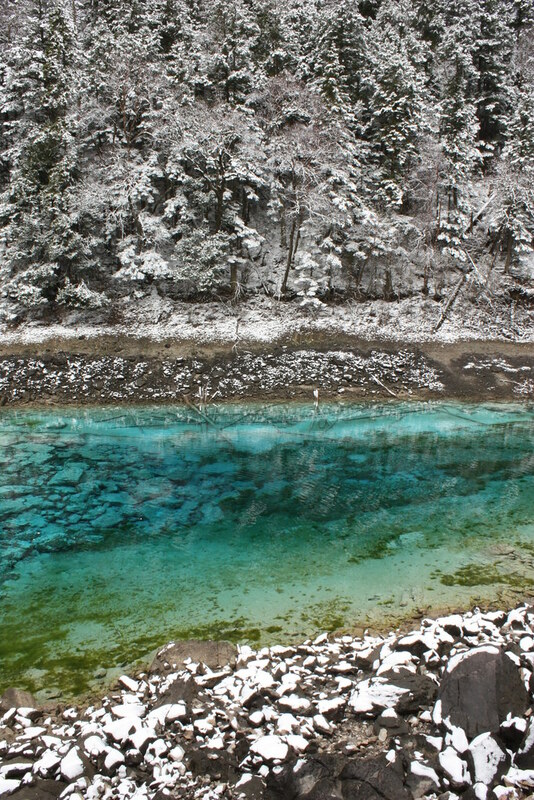 I remember looking for some warm clothes in Chengdu the day before we set out for Jiuzhaigou . We bought a bunch of warm socks (I still have them) and a few fleece jackets. We thought that would be enough. 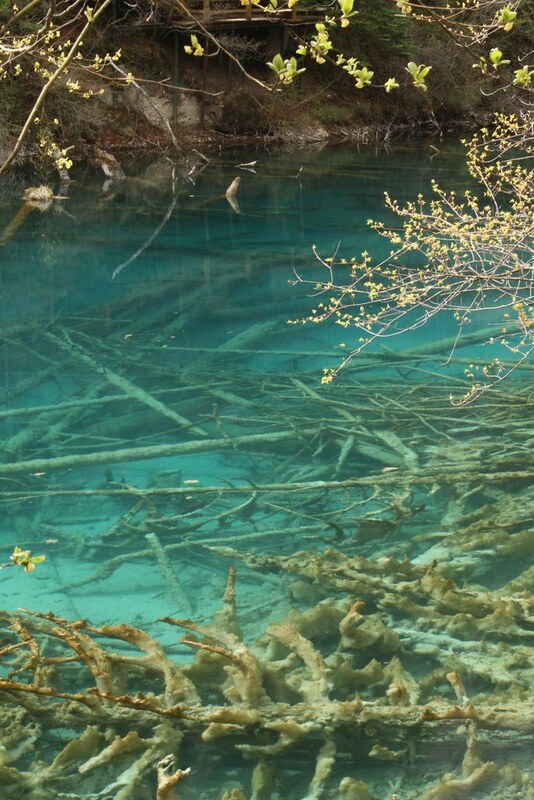 We had no idea how much colder Jiuzhaigou , China is at this time of year. Let’s see, while I’m typing this it’s 11:36 pm there. The sun will be up in 6 hours there. It is 58F today there with thunderstorms. We woke up the second day we were there to snow covered mountains. Looking outside, it’s hard to believe the winter is over here, but it is. I’ve been running by blooming trees and flowers for over two weeks. Supposedly it’ll get to the low 70’s here today and sunny, while it’s expected to hit 97F in my hometown of San Antonio, TX. Weather is crazy. If we think too hard, we may get overwhelmed with all the crazy variations of weather around the globe right at this moment. Traveling makes you think about these things more often. I’m often wondering what it’s like in some tiny little place we were at a year ago. And with the proliferation of data and the power of the internet, it’s fairly easy to check and be aware at any time of day what is is, wherever. 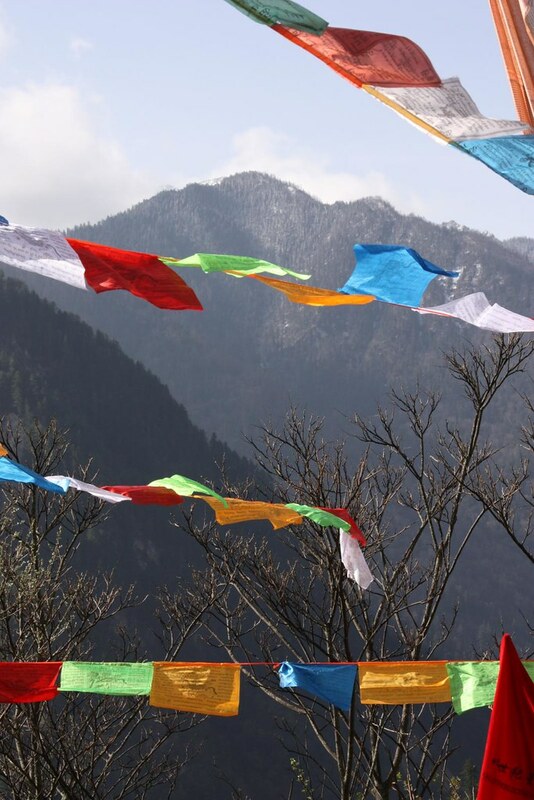 I remember the 12 hour bus ride up, which followed the river valleys for almost the entire way to the Tibetan valley of Jiuzhaigou, that is now and increasingly overrun by Han Chinese. 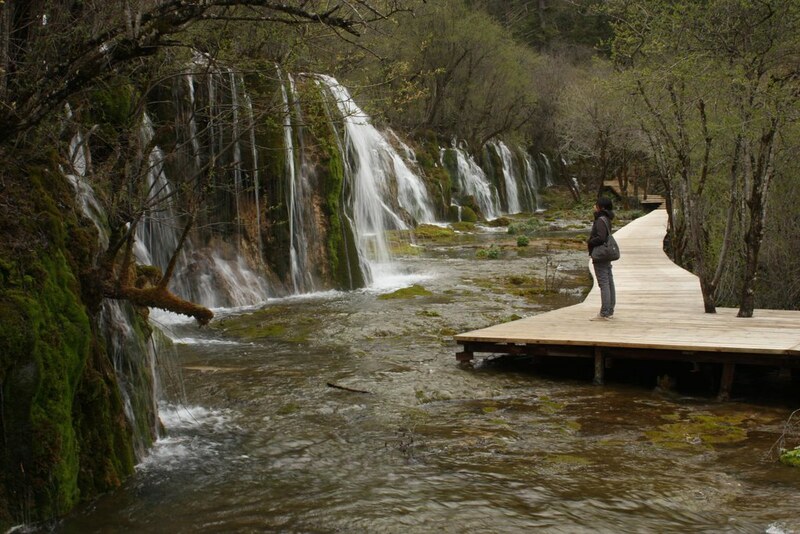 If you are middle-class or upper-middle class, heading to Jiuzhaigou sometime in your life has become the thing to do. Our bus trip following the gorges and rivers, passed over the damns and rock quarry’s that supply a lot of the raw material for the vast Sichuan province. Here and there signs of the 2008 Earthquake that rent homes and lives lay amidst new towns and buildings. 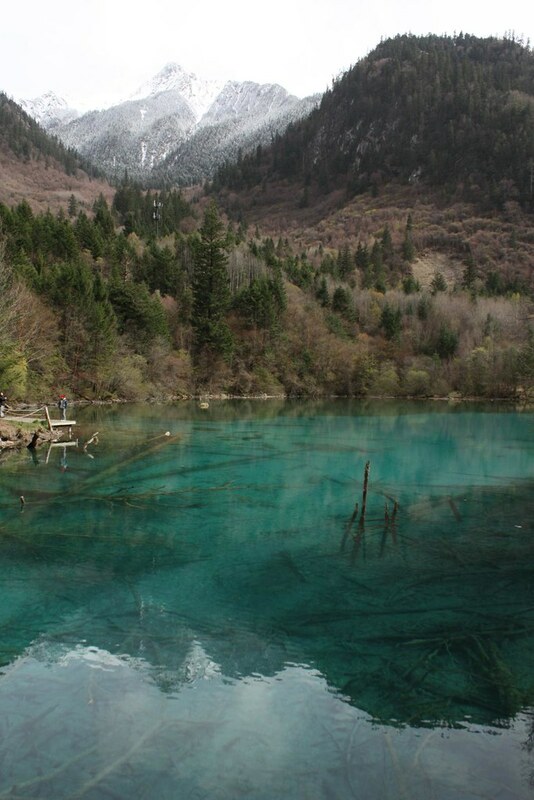 Jiuzhaigou has become a modern day wild west tourist destination and we hopped from the bus to taxi and were hustled down the main road, whistling past new restaurants and hotels that have sprung up over the last 15 years ending at a small village just outside the town. 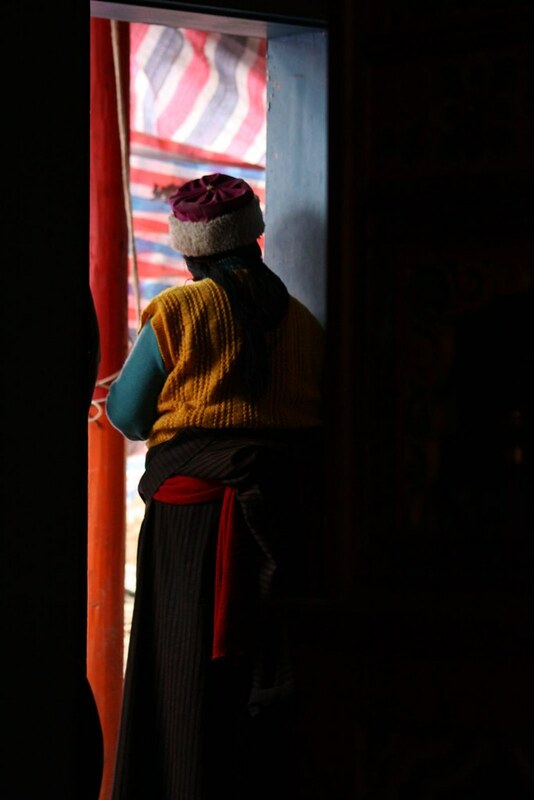 It was in the hands and open arms of a Tibetan family that we had some of our most remarkable moments in China. 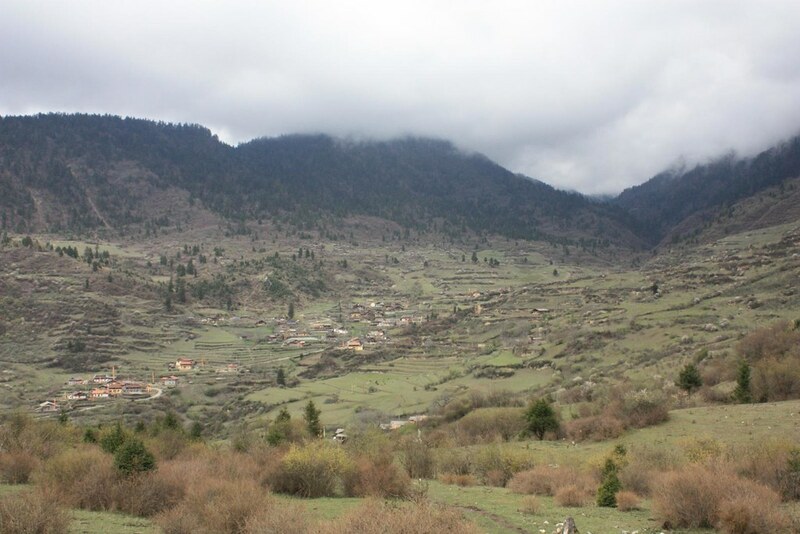 The villagers there live with a mix of very old and traditional houses with a few modern amenities. Stark is an understatement. One of the houses we slept in had an outdoor toilet, a hole between old wooden boards, off the edge of the house, a 20 foot drop to the pile below. Wind whistles through the slats. The man that lives there was in his late 70’s, at least. But the love and embrace of life there is something I’ll never forget. And thinking back to that time, I get a little warmer thinking of the time we spent with that wonderful family and village. When Lo San the young cousin of our host was gently coaxed by his grandmother inside. So, today I took a walk through our not so distant past. Here Lo San, being a terrible two monster of a child looks up into my lens. His dad watches proudly while Lo San gets up to something else. 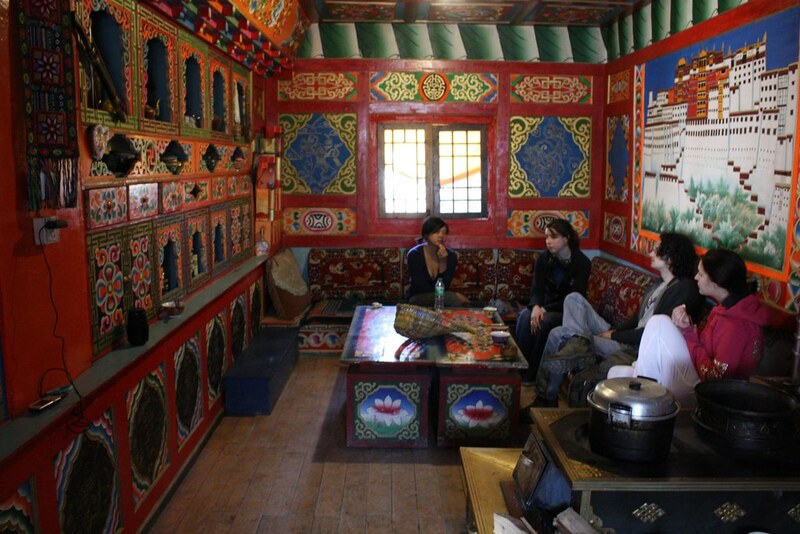 Then we huddle inside, warmed by the fire and the yak butter tea, some relishing it while others look upon with disdain and anxiety. Over that 24 hours that was this day one year ago, when looking back over the imagery, it looks as if we floated through the minutes. 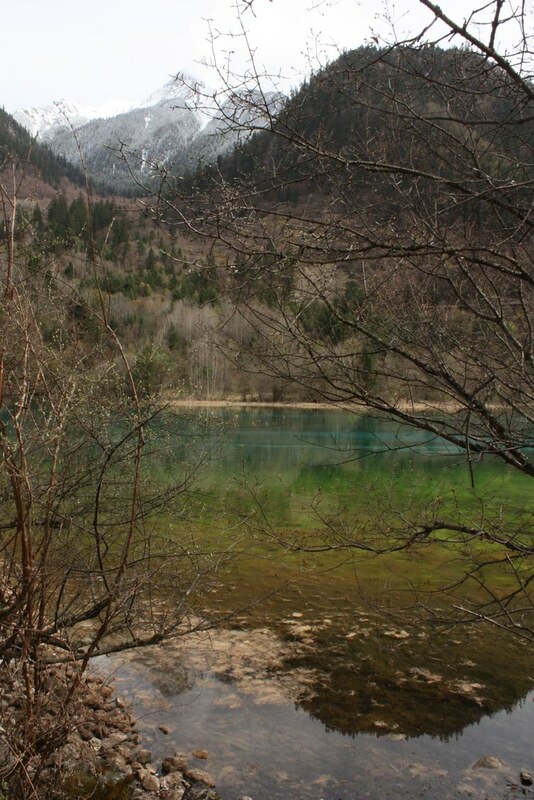 The day passed here while we went to bed and then rose early to walk the valley and national park in Jiuzhaigou. 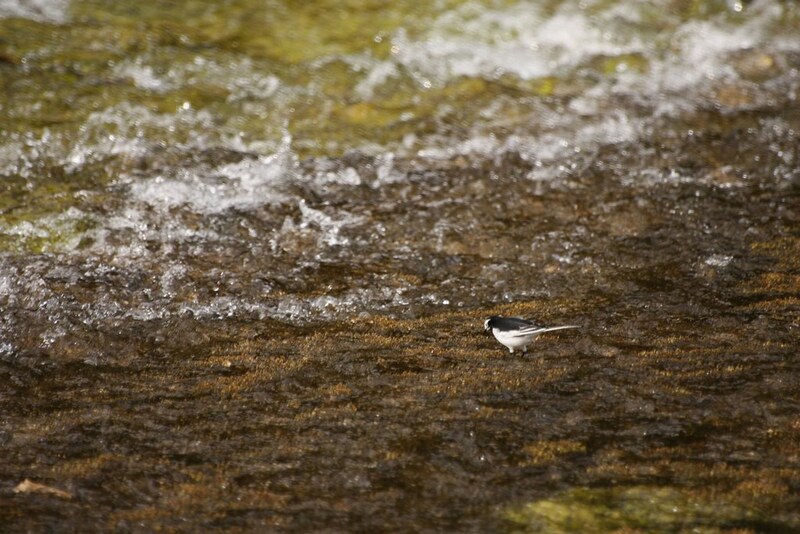 Here Tracie ponders the stunning quiet found in the noise of a bank of low waterfalls. We walked a good amount of the length of the park, hopping on the constant hum of trams full of chinese tourists, here and there. We wanted to get our money worth at $50 US each for one day in the park. We strolled for about six hours. With thoughts of that day we plunge into today. Meet Yoshi. One of the unfortunate things about visiting a place far away is that there are always things you regret not doing. Below is the best photo of Yoshi I have. Like so many other wonderful people we’ve met in our travels, we didn’t take enough pictures of or with him. Viewed in a positive light, it’s one of the millions of reasons to see these people again. Notwithstanding there are qualities within this photo I’d never have captured had I known I would forget to take a few more. I like the following photo of Yoshi. But before you look at it I want to try and describe the man himself. I understand you never fully know a person, however a some you can learn a lot from someone that is willing to open their doors and let it all hang out so to speak. Sure, in Japan it’s a culturally significant act. If you’re going to be a host, you’re going to be the best damn host there is and that means opening up your life just a little bit. But people will surprise you when you least expect it. In Japan, the level of hospitality that we experienced, its something that will make you feel like you’ve never felt before. Here in the states we’re all so afraid of letting people in, letting people get close. And the Japanese, in our films and books and history, have this reputation of being stand-offish. 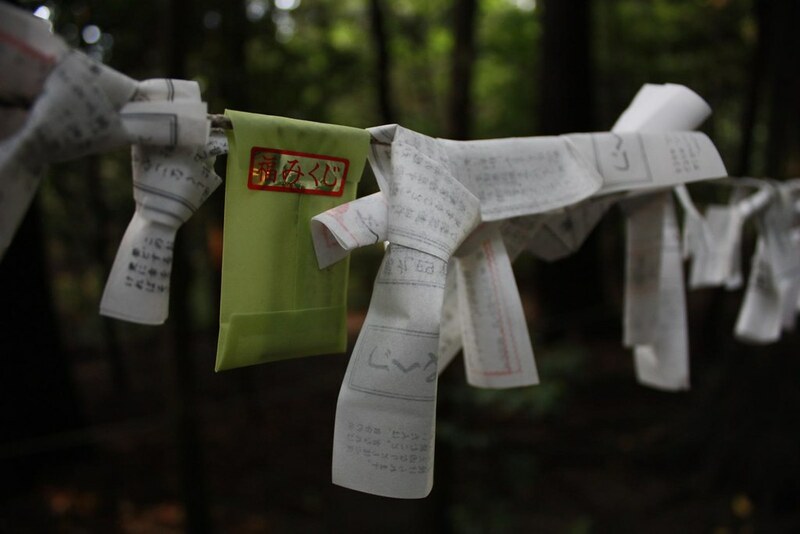 There oceans of books about the closed society that is Japan. Some would say the glimmer that Yoshi shared with us was more to show that the Japanese are extraordinary and unique, but I would argue he did it to show us how similar we are and how culturally unique we all are. There is much to be gained in letting your guard down and opening up your trust. I’m still learning. Hopefully by the time I lay to rest for good, I’ll understand how all this works mostly. Yoshi brought me and I think us both closer towards opening our hearts fully. We spent a little over four days with Yoshi and I grew to respect and love him as a friend and wise soul. It’s not just that he took in complete strangers and hosted them in such a welcoming and open manner, it’s that he did it with pride and caring. 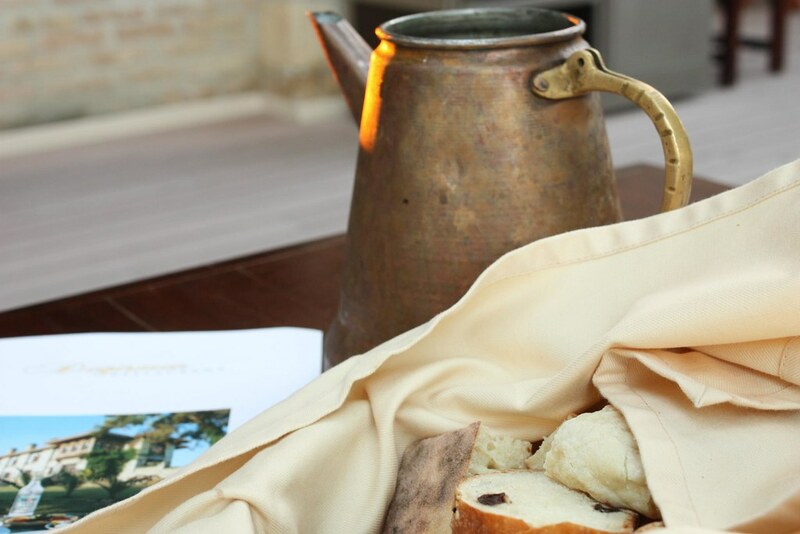 Hospitality with no-expectation of anything in return. It wouldn’t be such a big deal and I don’t think I’d go on about it so much if I felt I could encounter it a little more here in the states. But I remain a skeptic, an un-trusting, fearful, questioning American at heart. 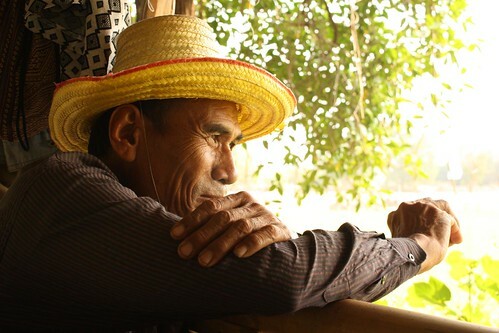 But this man let us into his life, his home and showed us the beauty, joy and delight that can be lived in a very unique culture that began hundreds of generations before ours. In turn, he shared with us his respect and value of some of our very own cultural values that are questioned and frowned upon by people within our very own borders and shared with us his delight for the exceptional nature of our own country and that its position in the history of the world isn’t something to be taken lightly or belittled as much as we do.He taught us respect. Respect is not something that is permanent. It’s hard gained and a long and winding road. The potholes are huge sometimes and it could use a good paving. He showed us we could be the pavers or the ones driving over without slowing down. That was in our hands. Yoshi is man that stands tall at around 5 foot 7. Every move seems deliberate, unsentimental and unwavering. Here he stands in front of a roadside egg vending machine. They aren’t the eggs he usually buys, but something of a novelty that he wanted to share with us. Us being interested in food. The sun in Kyushu is unrelenting at times and Yoshi is always prepared. Khaki safari shorts, cut just above the knee hung loosely over his energetic, seeming, thirty’ish frame. His golf shirt, collars thankfully cuffed where they belong, curled and resting on his tense shoulders, his sunglasses firmly concealing his glimmering eyes. His corporate hat pulled just over his brow, brim slightly curled from moderate wear. Gold bespectacled sunglasses flash the likeliness that the Kyushu day will blast us with its direct sun and dehydrate us with its steamy sea breeze. Skin a tanned hide of restful exertion in the South Japanese sun. Kagoshima like the Florida of his dreams. Snow falls infrequent and for brief moments at best. We haven’t spoken much about our time in Japan. By all means this is not because we had nothing to say, nothing to reflect on instead it’s quite the opposite. Japan is as it ever will be an intriguing and mysterious island for travelers arriving from a western perspective. A few hundred years ago I imagine it was even more shocking, for we have a world of bindingly interconnectedness. After we left Japan, the only country that came close to the particularly alone feeling that is Japan was Ireland. Japan stands out, culturally, geographically and as a place to move through. I’ve lived to see the innovation and capitalistic strength that has set Japan onto the world stage. The war was long over by the time I squirmed out from the womb but Japan has infiltrated our landscape in a way that few back in the forties would dare to believe. Yet, being surrounded by the products of Japan’s efficiency and export economy has not had the effect of bringing any sort of intellectual, historical or cultural understanding of what is Japanese. When we began in February to talk about the places in the world we’d like to try to visit on this journey, Japan landed at the top of the list. So, we dug through our minds and eeked out a few loose connections that we had to the far flung island. I’d been working in fine dining as a Chef in NY for a few years, short by any stretch of the imagination for old-school Chefs, but I had managed to make a great many friends and connections in that short period. After I’d let my restaurant know I was leaving I pulled Nafumi, our Wagyu beef supplier, aside and told her about our plans. We’d been ordering from Nafumi for over 3 years so it just seemed natural to ask her. I spoke with her on the phone more than much of my family. As soon as she learned of our interest in Japan and our supposed itinerary she insisted that we come over for dinner and discuss how she could help us in exploring Japan. Nafumi had always been a hard lady to bargain down prices, so I chose not to argue and welcomed the opportunity for a new friend. We spent a lovely evening at her house and enjoyed a nice braise over terrific wine. She made a commitment that she would ask all her friends and see if she could find us a place to stay or two while we were there. We were shocked and thankful and left her home glad to have such a wonderful new friend and advocate for our adventures. Time compressed and shoved us all the way to Seoul before we realized that we hadn’t done a good job at finalizing our plans in Japan. We had found a intriguing farm to stay at but that was about a week and a half away and we were leaving Seoul in a few days. Time was getting short. We began barraging Nafumi with follow up emails within a few days of realizing we were getting too close and needing to purchase tickets. The prices were creeping and for any of you that have ever traveled to Japan, you know how it is; for those who’ve yet to go, save all you can. We didn’t hear from Nafumi for a few days and started to panic. We quickly booked a flight to Tokyo as we needed to leave Seoul and be in Japan with plenty of time to find the farm we wanted to visit. The next day, I get an email from Nafumi. “Ok, Wayne. You are good in Kagoshima.” She goes on to explain that her friend Yoshi is available and willing to ‘host’ us. We quickly called the airlines and changed our flight from Tokyo to Kagoshima. We were on our way to Japan. Into the arms of a total stranger. We only knew he was nice and would pick us up from the airport. For the last few days in Seoul I put all that out of my mind and didn’t really think about it until we were on the plane to Japan. Who is this guy? What will he be like? Are we intruding? What are we getting into here? Tracie and I have been members of the Bed-Stuy CSA for a number of years. This is one of the few sources of high-quality, low-cost, local fresh produce for our neighborhood. Please join us in growing the farm and helping them recover their losses. This October, Conuco Farm and Evolutionary Organics were struck by a devastating fire, losing a season’s worth of storage crops, farm equipment, and personal belongings. Join us for three upcoming fundraisers to help rebuild what was lost so these farms can grow for many seasons to come. Check out a season of photographs of Eagle Street Rooftop Farm and do your holiday shopping at our auction! Live music, food & drinks. Conuco Farm is the Community Supported Agriculture farmer for Bed-Stuy Farm Share. They have driven fresh produce to Bed-Stuy each week for 5 years. We’ve been able to depend on them all this time, we ask you to help Conuco Farm today so that our neighborhood can continue to rely on them. Make a donation to the farm directly here. Print this flyer and take it to your Holiday Parties and spread the word! Organizing photos is more labor intensive and time consuming than I’d ever imagined. Despite the technological advances of digital media over good ol’ strip film (anyone remember that?) sorting through over 10,000 photos is still an onerous task. But, que the drum roll please. Let us present the most important and we think best photos from our trip (at least of the ones we took on our digital SLR). We’ve organized them by the timeline of our trip. The locations are as follows: Singapore, Thailand, Hong Kong, Southern China, South Korea (Seoul), Japan, Beijing, China, Italy, Turkey, Germany, Ireland, Germany. Whew. That’s a mouth full. So, from 10,000+ I present you 469 of the most interesting. Each photo generally has a caption or tag explaining what and where it is. Enjoy. More reflections to come putting it all in context. Still so much to write. We may have mentioned it in passing to some of you or maybe even somewhere in the depths of our musing here, but as near as I can figure we can’t say it enough. Signs of human impact on the world’s weather systems seem clear to us from our travels. While our evidence and stories remain anecdotal at best, I think they still need to be shared. Every voice on this issue should be heard. Two days ago in the NY Times, an Op-Ed piece by a farmer, Jack Hedin, out of Rushford, MN, shared his observations on weather patterns and their detrimental effect of an extreme nature over the past 3 years in a piece entitled ‘An Almanac of Extreme Weather’. This piece hits home here as we work towards opening a store and later small farm ourselves in the coming months to years. I highly recommend his piece if only to provoke some discussion on more thoughts on shaping our food systems here in United States. As conversations in and around the politics of food and sustainability in smaller farms gets more and more divisive with some posing it as a selectively ‘elite problem’ I want to suggest that soon, we may all be at the mercy of far greater issues beyond food price heading right down to food scarcity brought on by increasing extreme weather conditions around the world. Smaller farms that work towards sustainable practices, I’d argue are very much our hope for changing the weather systems to something more positive, if we can grow the base and add farmers that are interested in this. One of our first stops of our travels, landed us in a little known province of Northern Thailand called Isaan. There we were lead by Jo Jandai and Peggy Reents of Pun Pun Center for Self-Reliance on a tour a famers that were working their land by paying attention and working to sustain their local ecological systems and have limited negative impact to these ecological systems they’re a part of and in turn were making positive impacts on their community. 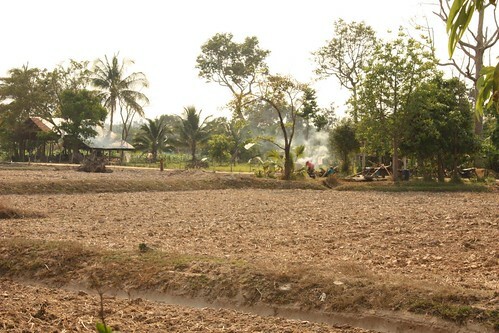 In our brief ‘Sustainability Study’ saw evidence of micro-climates that were preserving indigenous plants and animal life on farms such as Paw Jo’s, whose farm stood out in the sun drenched drought stricken fields of the Thai summer like an Oasis in the desert. And it literally was. Paw Jo had noticed that on his land he had a pond, a forest and the cultivated areas of land that he’d been using for a number of years and rather than clearing the land where the pond or forest sit he’d decided to let them stay and instead plant near and amongst these indigenous features. 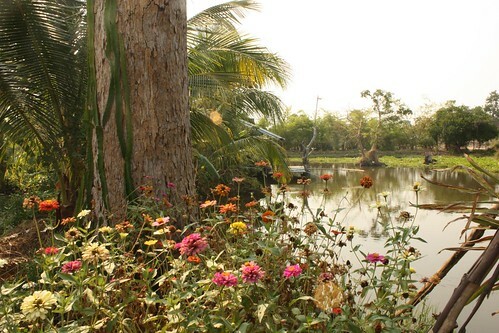 The pond and forest, being on his land, adjacent to his cleared and cultivated area acted as a barrier to pest and disease. At every turn of conversation he would chime in something about his garden and land as his medicine. And his strong hands, healthy body and clear eyes and sense of humor all spoke loudly in support of these claims. Take a look at the man Paw Jo and a few glances at his farmland and gardens. Paw Jo, watching a few birds fly in over his test ‘dry-season’ red rice crop. Looking out from the entrance over his pond and into part of his forest. A look across a neighbor’s farm over to Paw Jo’s in the background. Number one thing that has been most challenging in returning from a long trip abroad and then diving right back in to New York City has been a latent resistance to the return of the pace of the city life. And I remember swearing to each other that we didn’t want to return to that pace when we came back, but here we are and I think we are moving even faster and busier than before. How does this always happen and why does it feel right and ok this time? Off and on I’ve been trying to answer these questions and finally it’s hit me right in the face. As I sit here reflecting on yesterday’s connections made and connections missed. When we stepped out of our routine of daily life we were able to give ourselves an opportunity to really look at how fortunate our lifestyle is and how much more we can do in this world if we take it as an opportunity rather than a right. We have re-discovered the greatness of the ideals and underlying belief system that swells from the shores of this country. Every individual impacts the world, but we have built a unique civilization whose very existence and progress has shaken the foundation of belief systems around the world. And we can choose to move through life and fail to pay attention, fail to think about and react to our interactions and fail to impact the world in a positive way or we can step up and do something with that opportunity to shape our influences in powerful and positive ways because we are these fortunate individuals that have transformed a few powerful ideas into a way of life. Throughout our trip, everyday balanced on our connection to others and their individual actions. We were dependent on strangers and they carried us through. Strangers became life-long friends, friends and family grew closer than ever before by following our story on the internet from abroad as we hurtled further and further physically away. This would not have been possible if we were from another time or another place. So, in our return to the busy-ness or business of this American life we return with a renewed sense of purpose and this propels us faster and faster every day. No longer are we fearful of the busy-ness of the city or the world, rather we are driven to make more and more connections which pushes us that much closer to our eventual undoing where it all will just seem like a flash in the pan. But will we be just a flash in the pan? I hope not. And as we lay back in our warm and cozy bed this morning we talked about our dreams of the night and of the future as the changes in light pushed me out of bed and into the kitchen where a cup of hot coffee was minute a away. Fresh water flowed into the electric kettle, energy thrust it up to a temperature that would give water the unique properties that forced open my eyes and excited my body and mind such that I had to sit down and share a few reflections from the road less traveled by us and more considered. And so we let go a bit of the resistance to life threatening and unyielding pace and leap forward to new ideas and connections and are thankful for the ones that brought us to places we’d never imagined and then carried us home. We take another look at fall light and leaves as they both drift and blend into winter and recognize that we will take what we can get and make the most of it. Since we’ve returned from our travels abroad, it’s been a whirlwind month of reflection, visiting friends and planning our future. One of the main reasons we set out into the great blue yonder was to gather inspiration for a few ideas that have been rumbling around in our heads. We wanted to visit people on the other side of the world who had similar values or intentions. While we were on our way, Tracie’s sister Sannie emailed us and reminded us that since we were headed to Hong Kong we should really try and meet up with King and Margaret, Tracie’s aunt and uncle’s close friends. Sannie gave us the number and while we were there we called them and asked if they wanted to meet up. As you know , one thing led to another and King and Margaret pointed us in the right direction for several people to talk to and visit with during our trip. They understood our intentions for the future and got our vision. Like that they put us in contact with Lejen Chen, the Bagel Lady, in Beijing, China. They told us we should look her up when we got there and Margaret even sent off a polite introduction via email. But Beijing was a long way off from Hong Kong. So, we didn’t move too much towards setting up our meeting. We kind of put it off. And that’s too bad, because we only had one lovely day with her. One day was enough, however, to give us a new perspective of what Beijing could be. We’d been down and out on Beijing. Hating it, in fact. It’s huge. Everything is built to intimidate and control. It all started with the Forbidden city some 600 years ago. To give you an idea of how huge it is, we spent a whole morning there and we only got to the interior wall of the palace – we didn’t even make it to the living quarters. 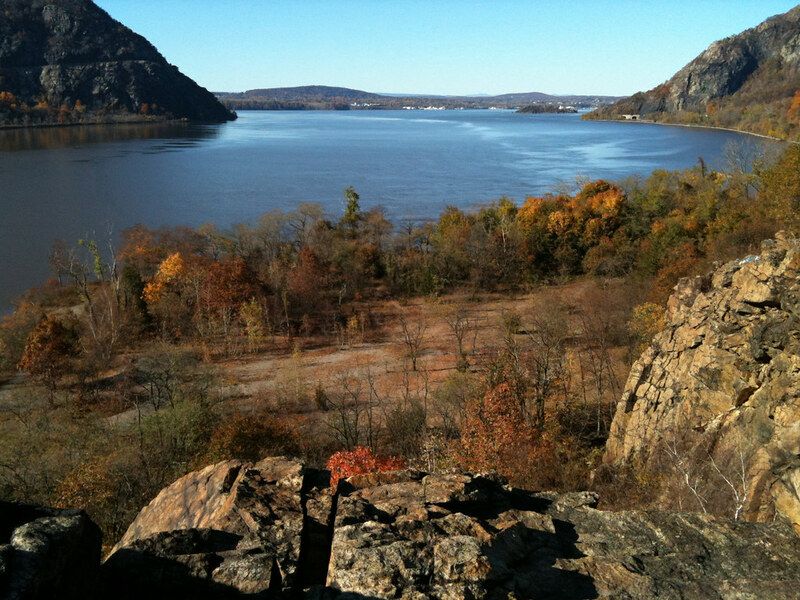 And there are wide expanses of granite or slate pavement that batters your knees and sears your brow. I can imagine a little bit how it must have felt to foreign dignitaries that arrived at the gates. Awestruck is an understatement. But there is this emptiness to Beijing’s scale and growth. While the history is there in the Forbidden city and other sites around the city, it’s also crumbling as you head to the metro. Vast blocks of centuries-old neighborhoods are leveled while you sleep off your dumplings from the evening before. We wondered if there was any kind of cultural preservation. It seems that everyone and everything is all about making the fastest buck. Nothing slows down. Its all crushing, bearing down on you, hard to breathe. Then we received a phone call from Lejen, that she was back in town and was going to be available one of the days we had left before we headed out of China. So Tracie put her head down and mapped out a course of action for navigating the Beijing bus system to make our way out past the 3rd ring road where Lejen’s restaurant, Mrs. Shanen’s, sits. It’s in a mostly expatriate area. I mean, who else would be looking for a bagel? Not the Chinese you’d expect, but she has built a local clientele base, some of whom have “pioneered different preparation techniques” from frying to dredging in sesame paste and butter1. 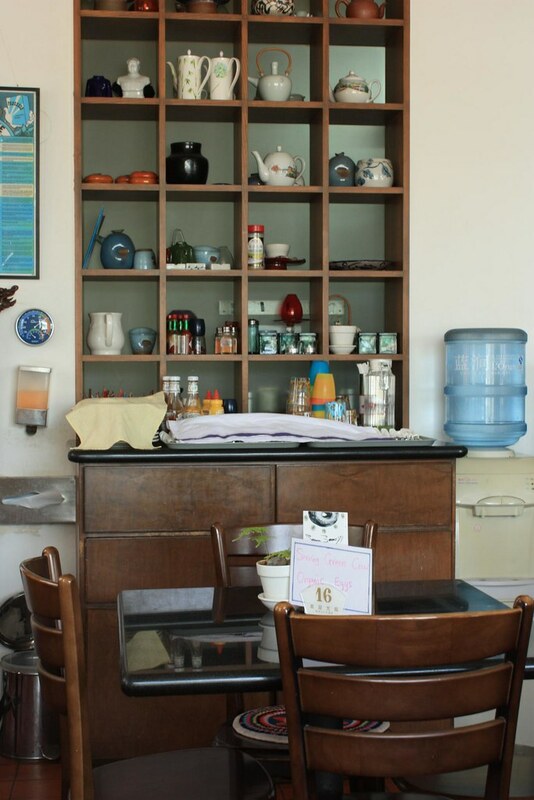 The restaurant is a roadside cafe sitting out in desolate surroundings amidst new outcroppings of expat gated communities and industrial parks. Never judge a book by its cover or its location. The dining room was one of the most relaxing we set foot into in China. She’s definitely created an oasis in the middle of a desert. 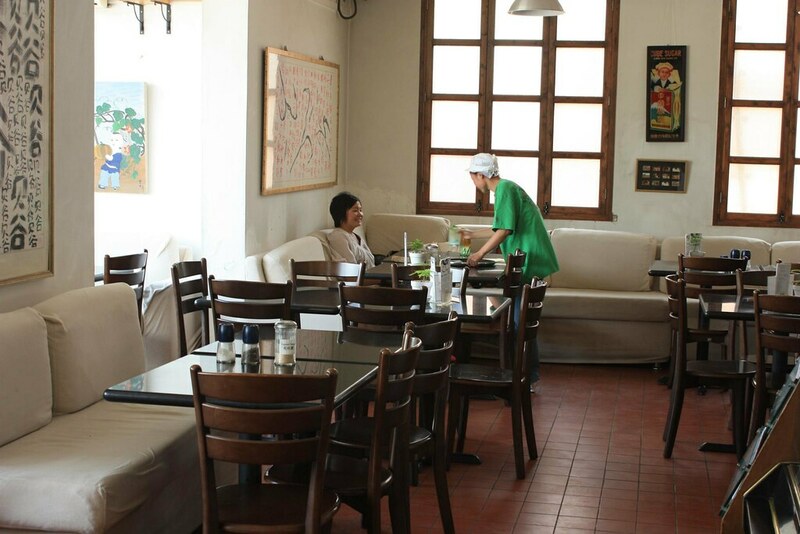 It has the vibe of quiet and ancient meditation while still maintaining a upbeat contemporary European look. 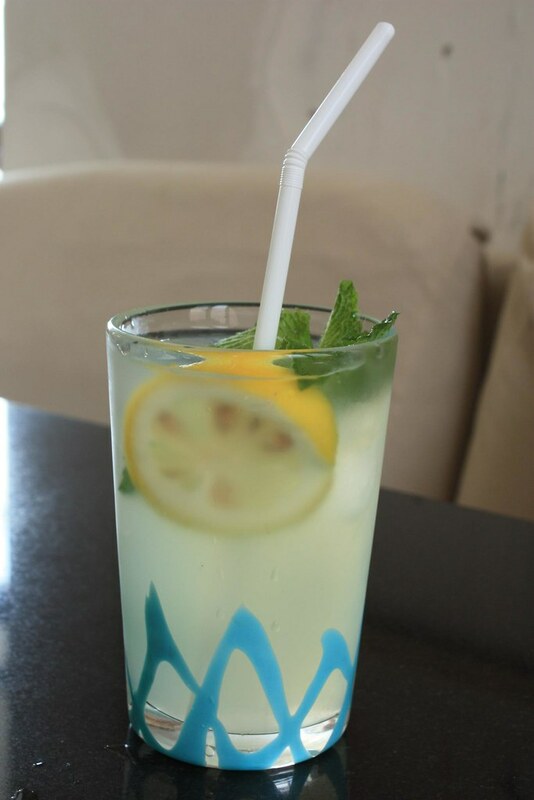 Step in from the road to fresh lemonade, Arnold Palmers, grass fed burgers, chocolate cake, bagels, Fair Trade coffee and delectable Chinese teas. There is nothing like stepping out of the Beijing heat into a quiet American style cafe. Forget the culture shock of China, welcome to the culture shock of little America in China. 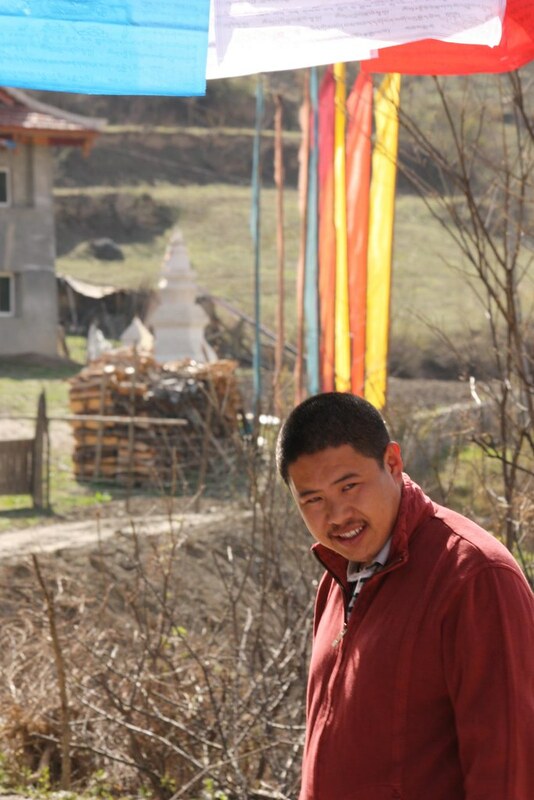 But Mrs. Shanen’s and Lejen Chen are beyond satisfying an expatriate community in China. They are also enriching a culture that seems lost and a partial reflection of what it could be. Lejen has found a way to fill a need and spread little flowers while she does it, figuratively and literally. What is a börek? Put simply, it is a savory pie: a filling, usually of cheese or meat, is sandwiched between sheets of thinly rolled-out dough. 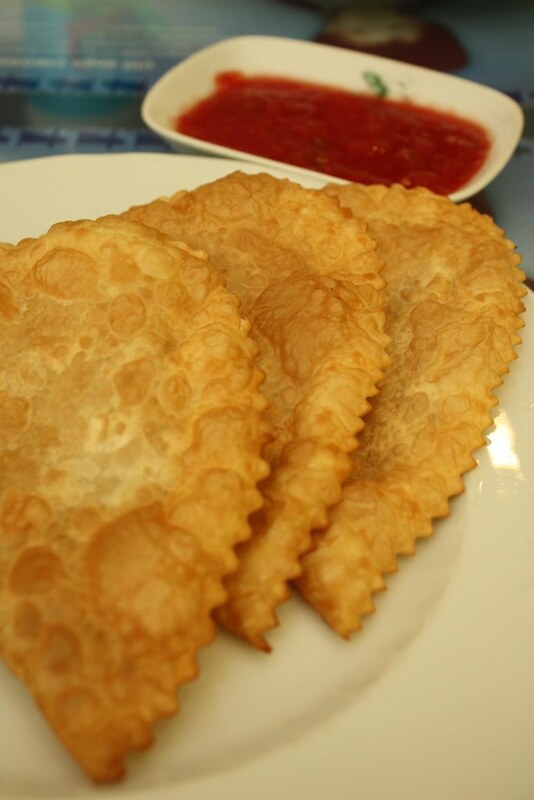 It is baked, or pan-fried, or deep-fried, which allows the ingredients to combine in a delectable marriage as the filling melts, blending to a creamy consistency inside a crisp casing of pastry. “Simply Sensational”, Berrin Torolsan. p. 346. Istanbul: The Collected Traveler: An Inspired Companion Guide. Ed., Kerper, Barrie. I couldn’t really have described it any better. Some mornings we’d smell the rich scent of börek wafting down the alleys and we had to find our way to the nearest börekçi (shop that specializes in making börek) and fill up on an entire bag’s worth of them. They’re best when freshly made – when you bite into them, there’s a crisp airiness that I still dream about. I was especially fond of the cheese and spinach ones, but there were plenty of other fillings like ground lamb or potatoes or straight cheese. They’re made from yufka, thin unleavened sheets of dough similar to phyllo, so their shapes and sizes could vary widely. We saw cigar shaped ones, puffy ones, triangle ones – each börekçi had its own specialties. In Eskesehir we were quite lucky to try çiborek, a variant on börek that apparently came from the nomads in Central Asia. They seem like a cross between a flaky pastry and a dumpling, filled with minced beef and onions, and comes burning hot out of the fryer. When we bit into it, meaty-fragrant juice leaked out and scalded our tongues but at the same time we couldn’t eat them fast enough because they just tasted so good. çibörek – eating nine of these is considered a normal portion! Another savory bread-based snack that we encountered was gözleme. 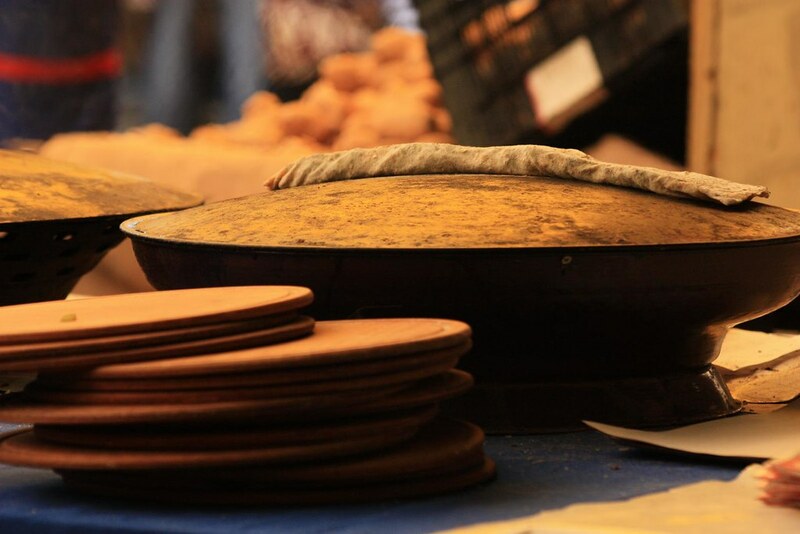 It’s a thin dough that’s rolled out by hand and cooked on a saç, a convex shaped griddle/oven with a flame underneath. Yufka is also traditionally made on a saç, but yufka is much thinner while the gözleme dough is more the consistency and thickness of lavash. Once the dough is almost done cooking, fillings such as cheese and spinach are placed in the center and the dough is folded up to contain the filling. 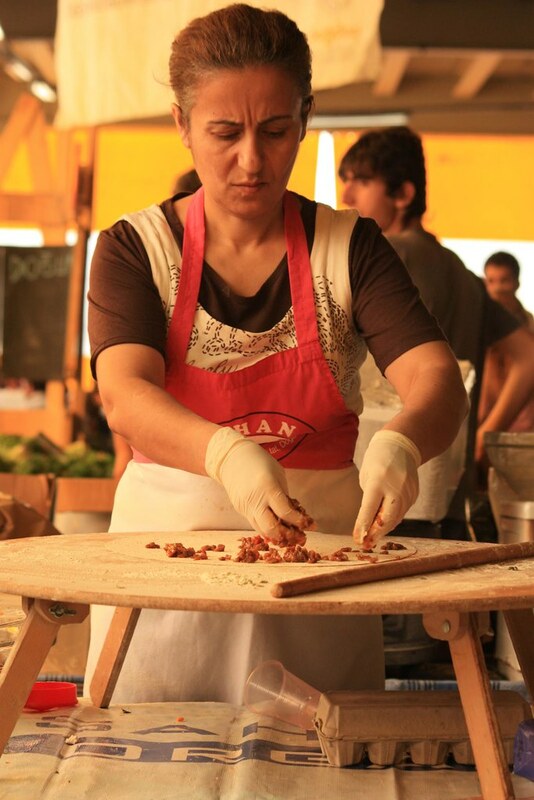 By far the best one we had was at Bugday‘s organic market in Istanbul on Saturdays, as it was made freshly by hand. We found gözleme at every café in every bus station and town we visited, but often they had been sitting there for hours and were rather soggy. So we recommend a trip out there to try some. So now you have all these meze on your table – what do you eat it with? Bread, of course! To say that Turks “like” bread is the understatement of the year. We had bread with literally every meal of the day, every day. Early one morning on the farm we were on our way to the fields in a cart attached to the back of a tractor. Suddenly the farmer pulled over and ran into the corner store. We realized, oh, he’s grabbing a huge loaf of bread to go with breakfast! (What do the girls we’re working with buy? Lollipops.) We observed a few types of bread (ekmek) that seemed to be most common: giant loaves of white bread similar to scali bread, pide, which is similar to pita but without the pocket, and lavash, which is a thin type of flatbread that’s slightly thicker than pide.